The local Indivisible chapter is campaigning hard for Jon Ossoff, but they have their eyes on a bigger prize as well. These suburban Atlanta Indivisible activists once seemed invisible—middle-aged, most of them mothers, some natives, many transplants, voting Democratic, sometimes not voting at all, in a deeply red congressional district that once belonged to Newt Gingrich. Donald Trump’s unexpected victory over Hillary Clinton changed everything here, shattering Democrats, especially women. There were signs of hope, though, even in the depressing election result: Trump beat Clinton here by only 1.5 points. The district has the highest proportion of college graduates of any led by a Republican. Sorting through the post-election rubble, devastated Democrats here found some clues about how to rebuild—and how to find one another. Indivisible is just one of many new progressive groups that’s aligned itself with the Ossoff campaign. (Some of the women I spoke with belonged to all of them.) Liberal Moms of Roswell and Cobb came first, uniting women who met at preschool meetings and soccer fields to take the first steps toward more visible Democratic activism. Then there’s the women-led Pave It Blue, which is more Yippie than yuppie (though not many are old enough to know what that means). They describe themselves as “ninjas.” They dress up like dinosaurs and make Ossoff signs that “glitter bomb” (the signs are bordered in Vaseline with clear glitter, so people who attempt to remove them find themselves coated in Vaseline and glitter). It’s a brilliantly defensive move: Sign removal has been a problem in this traditionally red district. And when their Ossoff signs began being set on fire, they started attaching American flags to them, since conservatives believe flag-burning should be illegal. Meanwhile, the black women activists of Georgia’s sixth district—who are, as everywhere, the base of the Democratic Party—welcome the newcomers. “We love the new energy, wherever it comes from,” Beverly Jackson of Cobb County Democratic Women tells me. The sixth is only 13 percent black, and it was sliced and diced to stay white, with adjacent pockets of black voters placed in the districts of Representatives Hank Johnson and John Lewis. Recent transplants, of every race, have begun to change the region—the district is now less than 70 percent white—but the transformation has been slow. I came to the district not to cover the campaign itself (I can’t, because my daughter works for Ossoff as deputy field director). But I wanted to understand the rumored progressive revival on the ground, whether it is for real, and see if can tell us anything about what has to happen for Democrats to take back the House and Senate next year. 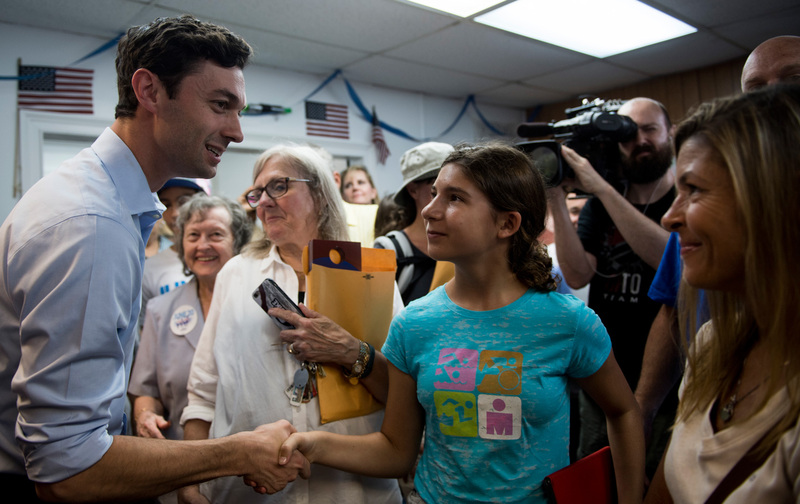 Win or lose, the activists around the Ossoff campaign show the importance of local actors’ tailoring their own appeal to the broadest possible coalition of forces. Here, diversity is about race as well as ideology. The Indivisible leaders here learned that fast, and with some discomfort, at their very first meeting. Right after Inauguration Day, Amy Nosek and Louise Palmer discovered the now renowned online “Indivisible” guide, written by congressional staffers Ezra Levin and Leah Goldberg, which tried to give fractious, grieving Democratic activists practical advice, partly based on the way the Tea Party thwarted the Obama revolution in 2009 and 2010. In February, they decided to try to gather some like-minded friends. “We expected 20 people,” Palmer says. More than 100 showed up at their local library. The two women looked at each other, stunned. “We never intended to lead it—we’re not leaders,” Palmer recalled over dinner Saturday night. They are now. There was early chaos. Palmer, Nosek, and a small group of friends struggled over language. Were they Democrats? Liberals? Progressives? Independents? None of the above? The women had settled on calling themselves Democrats. “We wanted to be aboveboard about it, and we thought: ‘Let’s not be afraid to say the word Democrat!’” Nosek recalled. “But I wanted everyone included: This is a numbers game. We want everybody—if we can get some Trump voters with buyers’ remorse, that’s great. It was my New York coming out. I’m direct, like Bernie. They weren’t quite ready.” She told the story over breakfast Monday, with Nosek and her young sons Quinn and Max in tow. Nosek chuckled. “There was a lot of angst,” she recalled. “It never occurred to us we’d get moderate Republicans turning out at this meeting,” Nosek told me. But they did. “I call us ‘progressive,’ because we are, but that can include independents and even Republicans, not only Democrats,” Palmer said. Another challenge presented itself to the two new leaders at that very first meeting: Two candidates for the primary had shown up. Ossoff had joined the Indivisible Facebook group before he’d announced his candidacy, so they thought there was a chance he’d be there. But he walked in with his campaign manager, both young white men in dark suits. Luther snickered when they showed up. “I joked, ‘Who are the young Republicans?’” Nosek and Palmer hadn’t intended to have politicians speak at this first gathering, but they made a fast decision to open the floor. Ossoff impressed the group; the second candidate didn’t wind up running. While the group has thrown its immediate energy behind electing Ossoff, they’re also playing a long game. After Essence Johnson attended the local Women’s March, she began to worry that the new wave of feminist activism that Trump had inspired remained too white and too privileged. “John Lewis spoke and that was great, but I drove home through black neighborhoods and poor neighborhoods and saw so many people in poverty, I knew so many women were in shelters. I said, ‘Louise we’ve got to do something!’ I mean we had white women in Range Rovers driving up to do voter outreach at bodegas. It wasn’t going to work.” Palmer agreed, and Johnson became Indivisible’s unpaid director of outreach. It hasn’t been easy, the 34-year-old business consultant says. “People here have been so disconnected from the fights of African Americans and immigrants. But it’s changing. That’s what I love about what we’re doing.” Indivisible has taken a special interest in canvassing apartment buildings, which campaigns often overlook, or at least under-canvass, because they can be hard to enter, and many voters are transient. But even if the campaign gives them other turf to walk, they do that first, and move on to less privileged enclaves. When the Ossoff race is over, they want to focus on continued registration of nonwhite voters. “In 10 years this district will be minority white, and people aren’t paying enough attention to that,” Johnson says. Brown, a gay, white 56-year-old heath-care professional, went by his middle name, David, until he realized what a great asset the name “James Brown” could be in politics and business. Now, it makes perfect sense to find a gay, white James Brown canvassing in racially mixed neighborhoods, or recruiting his GOP friends to back Ossoff. He tells me about his Republican friend “who didn’t even realize the medical insurance she had was “Obamacare;” now she’s a dedicated Ossoff voter making custom arts and crafts for his supporters.